Randy Boissonnault, M.P., Special Advisor to the Prime Minister on LGBTQ2 issues, Dr. Theresa Tam, Chief Public Health Officer of Canada, and The Honourable Ginette Petitpas Taylor, P.C., M.P., Minister of Health, with members of the CBRC team during the official launch of Advance in Ottawa. 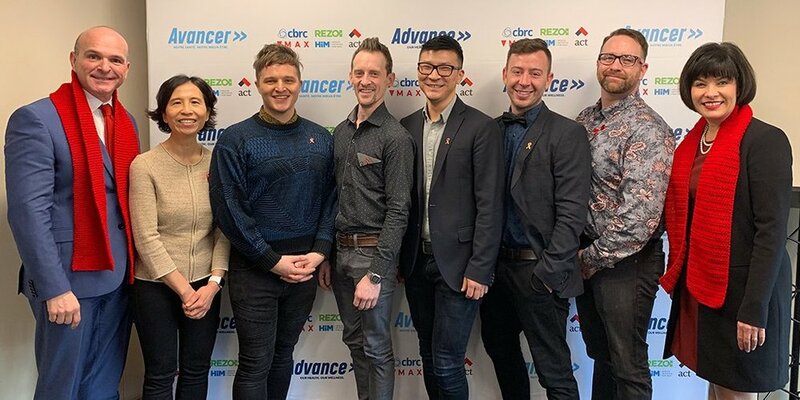 Through the HIV and Hepatitis C Community Action Fund, the Government of Canada is providing $7.1 million over five years to the Advance Community Alliance—a pan-Canadian community alliance for GBT2Q men’s health—to implement innovative approaches to improve access to STBBI prevention, testing and treatment for this population. The interventions will include new models for testing, along with interventions to increase access to services, and to promote new effective HIV prevention options. The Public Health Agency of Canada is investing $7.1 million to support this initiative. This is part of the Agency’s investment of $132 million over five years through the Community Action Fund. This funding will support community-based initiatives that have the potential to make the greatest impact in slowing the spread of STBBI, including HIV and hepatitis C.
Randy Boissonnault, M.P., Special Advisor to the Prime Minister on LGBTQ2 issues, Dr. Theresa Tam, Chief Public Health Officer of Canada, and The Honourable Ginette Petitpas Taylor, P.C., M.P., Minister of Health, with members of the MAX Ottawa team during the official launch of Advance in Ottawa.